Senator from Massachusetts. He has served 7 years in the Senate. What policy areas does Sen. Markey focus on, as expressed by his press releases? Learn more. What topics does Sen. Markey talk about in his recent press releases more often than other members of Congress do? Learn more. What members of Congress use language that is most similar to Sen. Markey in their recent press releases? Learn more. S.1214, a bill sponsored by Sen. Markey, was read twice and referred to the Committee on Commerce, Science, and Transportation. S.1214: A bill to establish and protect individual and collective privacy rights, and for other purposes. S.1197, a bill sponsored by Sen. Markey, was read twice and referred to the Committee on Finance. S.1197: A bill to amend the Internal Revenue Code of 1986 to establish a tax credit for construction of new all-electric homes. 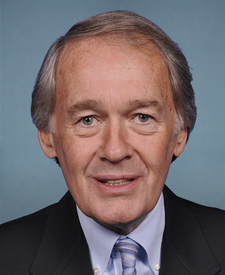 Sen. Markey released a statement: Senator Markey, and Reps. Lofgren and Neguse Introduce Legislation to Welcome Refugees to the U.S.